Creamy Broccoli Soup is super creamy in texture. Creamy Broccoli Soup is easy, quick to make and dairy free. This Creamy Broccoli Soup gets a thick, creamy base from cashew nuts and potatoes. Broccoli is one of the very low calorie vegetables; provides just 34 calories per 100 g. Nevertheless, it is rich in dietary fiber, minerals, vitamins, and anti-oxidants that have proven health benefits. It’s warming, easy to digest and the perfect healthy treat for cold winter days. This Creamy Broccoli Soup is simple and satisfying and can be made in less than an hour. It is a good way to get broccoli into the tummies of fussy eaters. Time to bust out your soup pots! I have got an amazing soup recipe to share with you guys today. This Creamy Broccoli Soup can be made without cream! 1. Wash and drain the broccoli floret and keep aside. 2. Heat the oil in a deep pan, add garlic cloves, cashew nuts and sauté for a minute. 3. Add onion and sauté till light brown color on medium flame. 4. 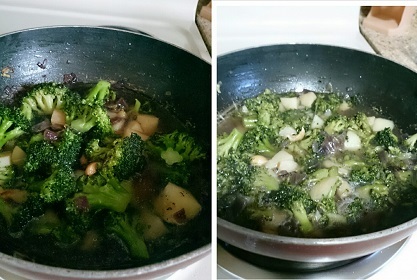 Add broccoli florets, green chili, black pepper, potatoes cube and mix well. 5. Cover the lid and cook it for 3-4 minutes on medium flame. 6. 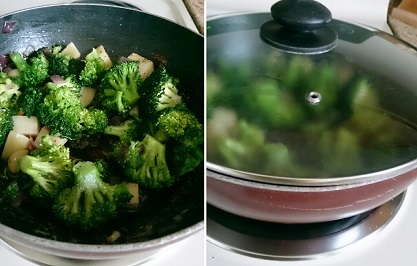 Open the lid, add 1 cup water, mix well and cook till all veggies become tender and soft. 7. Switch of the flame, let it them cool, and blend in a blender till smooth. 8. Remove from the blender, add lemon juice, mix well and serve. 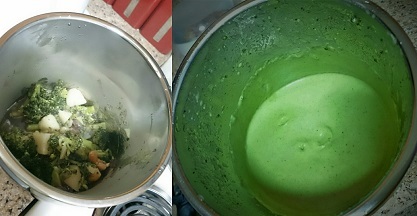 • If soup become thick, then add little water, mix well and warm it before serving. Creamy Broccoli Soup is super creamy in texture. Creamy Broccoli Soup is easy, quick to make and dairy free. 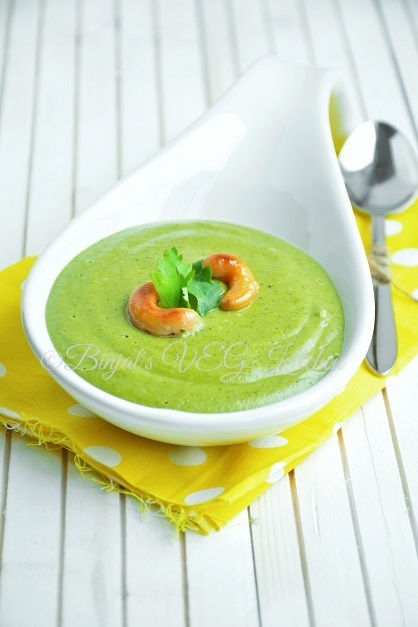 This Creamy Broccoli Soup gets a thick, creamy base from cashew nuts and potatoes. 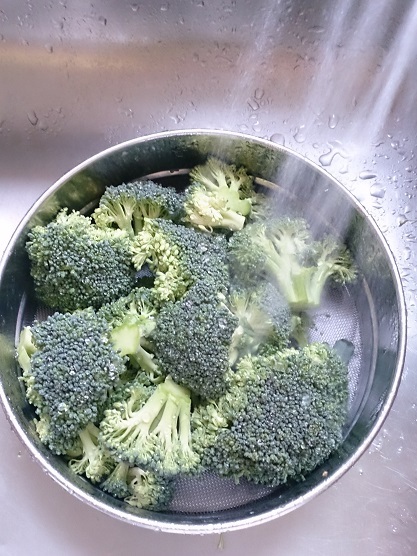 Wash and drain the broccoli floret and keep aside. Heat the oil in a deep pan, add garlic cloves, cashew nuts and sauté for a minute. Add onion and sauté till light brown color on medium flame. Add broccoli florets, green chili, black pepper, potatoes cube and mix well. Cover the lid and cook it for 3-4 minutes on medium flame. Open the lid, add 1 cup water, mix well and cook till all veggies become tender and soft. Switch of the flame, let it them cool, and blend in a blender till smooth. Remove from the blender, add lemon juice, mix well and serve. Just loved this…. will surely try for my son..